The Labconco Purifier Logic+ Class II A2 Biosafety Cabinet is a freestanding environmental cabinet that gives users personal workspace and protection from Biosafety Level 1,2 or 3 containment. Designed to exhaust HEPA-filtered air into the lab, room air is drawn into the inlet grill, creating a mixture of room air, and air passed through the work area with in the plenum. The contaminated air from this biological safety cabinet is then drawn up by the blower back through the plenum where 70% is either recirculated through the HEPA filter and back over the work area, the remaining 30% passes through two 99.99% efficient exhaust HEPA filter and into the room. This biosafety hood can also be connected to an exhaust system for use with applications involving minute quantities of volatile toxic chemicals, or trace amounts of radionuclides. This safety hood has an electronically communicated motor, that delivers a precise volume of air as required, automatically adjusting as the filter loads. This ECM consumes 60% less energy, and provides cooler and quieter operation. The Labconco Purifier Logic Class II A2 Biosafety Cabinet is constructed of durable powder coated stainless, with a stainless interior and a removable stamped one-piece dished work surface, and a fully closing clear 6.4mm (1/4”) thick tempered 10" safety glass sash and a counter balanced anti-racking mechanism. The Labconco Purifier Logic Class II A2 Biosafety Cabinet features a LCD information center that’s right at line of sight for the user, giving them at a glance monitoring of activities such as filter loading, cabinet components in use, and disruption in air flow, including a bar graph to show the remaining HEPA filter life. The info center of this lab safety hood also gives information on alarm conditions like if the sash is too high, if the filter life drops below 20% or an airflow change at the inlet or the exhaust. The touchpad control allows users to manually activate the blower, lights, timer, audible alarm mute, and menu selection. This lab hood also has the option of canopy connection, allowing this to be used with minute quantities of volatile toxic chemicals and trace amounts of radionuclides in microbiological research. During periods of nonuse this biosafety cabinet idles the blower at 30% to keep a particulate free environment. The Labconco Purifier Logic Class II A2 Biosafety Cabinet also features a built-in interval or elapsed timer for use with the UV light or experiment monitoring. This is a brand new scratch and dent model, please review the pictures and let us know if you have any questions. 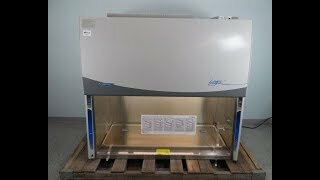 This Labconco Purifier Class II A2 BioSafety Cabinet is a brand new in original box with slight dents on bottom right hand side. Please review pictures carefully. Our service team tested and validated the biosafety cabinet and unit passed with a clean bill of health. All of our lab equipment comes backed with our standard warranty. Should you have any questions, please don't hesitate to contact us.